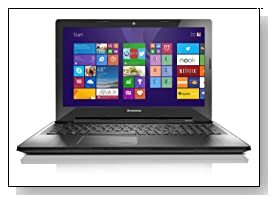 Black Lenovo Z50 59426432 is a solid and stylish 15.6 inch laptop portable PC with a powerful 4th generation Intel i5 processor and 6GB memory for efficient multitasking for work, study or home entertainment- great for everyday use, offered at a rather affordable price considering all that you’re getting. Lenovo Z50 has the Haswell Intel Core i5-4210U processor (3MB cache) at 1.70GHz base speed to 2.70GHz with turbo boost function, 6.0GB PC3-12800 DDR3L SDRAM memory at 1600 MHz, a Hybrid 500GB Serial ATA Hard Drive and 8GB SSD offering good amount of storage for your files- songs, videos, games and the 64-bit English Windows 8.1 operating system. The i5-4210U is an ultra low voltage processor with hyper threading- dual cores handling four threads in parallel and has a Passmark benchmark score of 3482 as of this review’s date. 15.6 inches high definition LED glare display with 16:9 widescreen cinematic aspect ratio, 1366x768 pixel max screen resolution and Intel HD graphics 4400 offer clear and realistic image with vibrant colour but remember this is not a Full HD screen so it won’t be super impressive. It offers rich and immersive sound through its stereo speakers with Dolby Audio certification and comes with an integrated 720p high definition webcam to let you stay connected / video chat with people. Intel HD 4400 graphics is good enough for running games like Minecraft and you don’t need an extra discrete graphics card for playing latest games at lower settings and is a good one for general daily multimedia tasks. It is about 25-30% faster than Intel HD 4000 and is more or less equal to a Radeon HD 7550M for performance. Sleek and modern Lenovo Z50 weighs just under 5.3 pounds and has the measurements of 15.11 x 10.43 x 0.98 inches- and has a very slim profile. It comes with a 4-cell 32 watt hour lithium ion battery that offers up to 5 hours of battery life depending on how you use it but the Lenovo Energy Management reduces power usage and protects the long-term durability of battery. As this is a Lenovo, keyboard is AccuType with slightly curved keys for comfortable and accurate typing but a couple of customers complained about the keys being a bit low. It comes with a built-in dual layer optical DVD Drive, Intel Dual Band Wireless-AC 3160, Bluetooth 4.0, 10 / 100 / 1000M Ethernet LAN, 1 x USB 3.0 port, 2 x USB 2.0 ports, an HDMI port, Audio Combo Jack, 2-in-1 SD / MMC card reader. Veriface Pro face recognition software that uses the integrated webcam to log you in. Conclusion: Lenovo Z50 59426432 is a modern, solid and affordable laptop computer with good entertainment and multimedia features, plenty of ports and connectivity options including a DVD drive but still manages to be slim and sleek. You will get some bloatware on it including McAfee trial version but you can simply remove those you will not use and replace the virus program with the free version of AVG that you can download online. Intel Core i5-4210 provides great processing power for office and multimedia purposes- along with the 6GB RAM but so things seem to run smoothly and the CPU speed goes up to 2.7GHz dynamically when tasks require it and stays at 1.7Hz for not so demanding tasks for less power usage. It comes with a 1 year warranty for parts and labour and good customer support if you need assistance. Definitely good value for money, especially for an i5 processor PC with 6GB system memory and a bit of SSD for fast boot-ups.